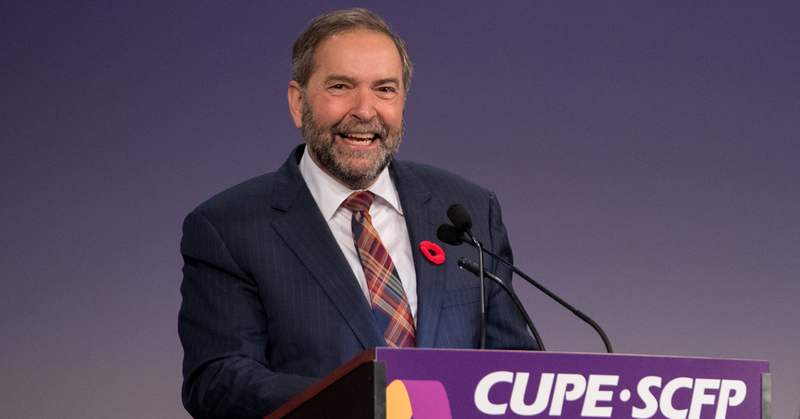 Tom Mulcair, leader of Canada’s New Democrats, capped off the CUPE National Convention with a pledge to work hard in the new Parliament to fight for the things that matter to working people. “The NDP will form a robust, progressive opposition that will hold the Liberals’ feet to the fire. Canadians can count on us to do that,” said Mulcair. Mulcair specifically highlighted the NDP’s commitment to a $15/hour minimum wage, a $15/day universal child care plan and closing stock option tax loopholes for the wealthy to fight child poverty as planks the party would continue to advocate for in the new Parliament. He acknowledged the results of the recent federal election, “weren’t what we hoped for, but we ran a principled campaign, something we can all be proud of” and he thanked CUPE members for their work in the election. Mulcair told delegates that just a few weeks ago, he had stood in the very same spot speaking to 5,000 supporters. “CUPE members were there as well—I won’t forget that,” he said. Mulcair paid tribute to outgoing National President Paul Moist and congratulated incoming National President Mark Hancock, and thanked every CUPE member for their ongoing support of the NDP. He also saluted the 13 CUPE members who stood as candidates in the election, including Alexandre Boulerice and Ruth-Ellen Brosseau, who were re-elected in their ridings.